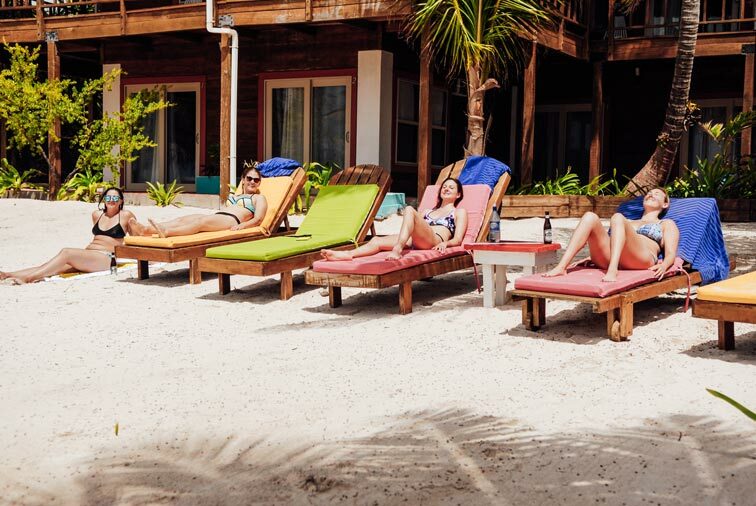 SYB Belize is a lobster and workout adventure that has everything taken care of including transportation once in San Pedro, all meals and beverages (including beer! 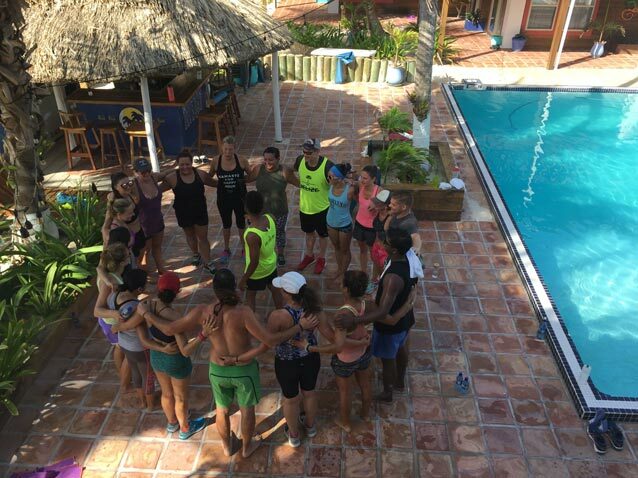 ), guided yoga and meditation practice, intense bootcamps, land & water adventures, and much more! Picture this: we wake you up with funky tunes and the smell of locally pressed coffee as the sun rises right outside your bedroom. The white sand beach is right outside our front door and the sunrise reflects in the clear blue water. You take in the sights and sounds of the ocean as everyone else wakes up with a similar mentality, and the positive energy is contagious. 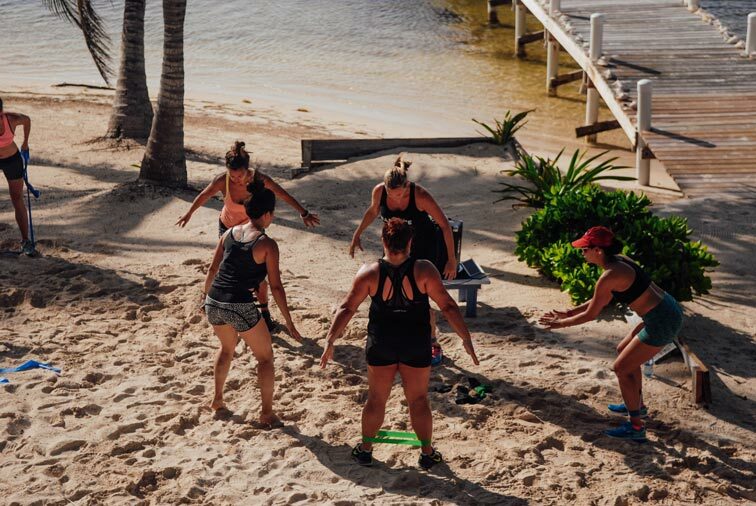 We channel the endorphins towards our morning beach bootcamp, and this is how we begin our SYB days in Belize! This adventure is all about location, amazing weather, and utilizing the environment around us. 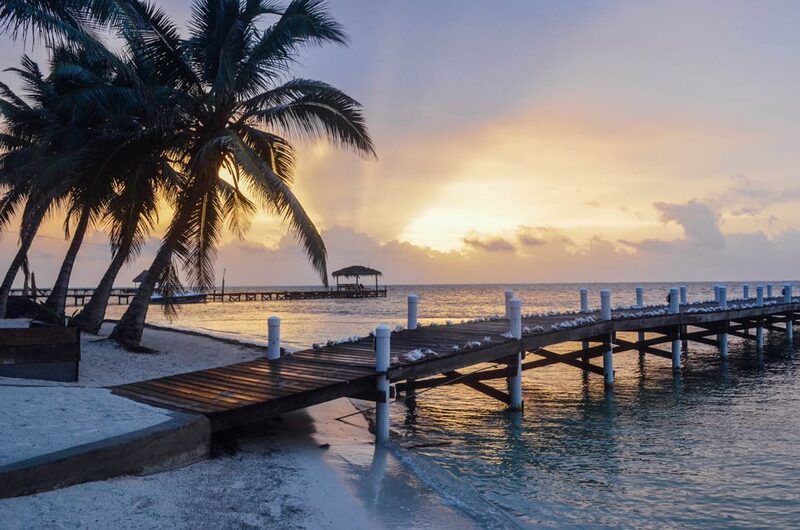 Belize is known for its extreme biodiversity, making it the perfect place for beach bootcamps, outdoor yoga sessions, and swimming with our fishy friends. Get ready to swim, snorkel, and sweat in one of the most beautiful places on the planet. Locally sourced meals will be served every day, from breakfast smoothies to filling dinners. And the best part - we have our own private beach bar all to ourselves. 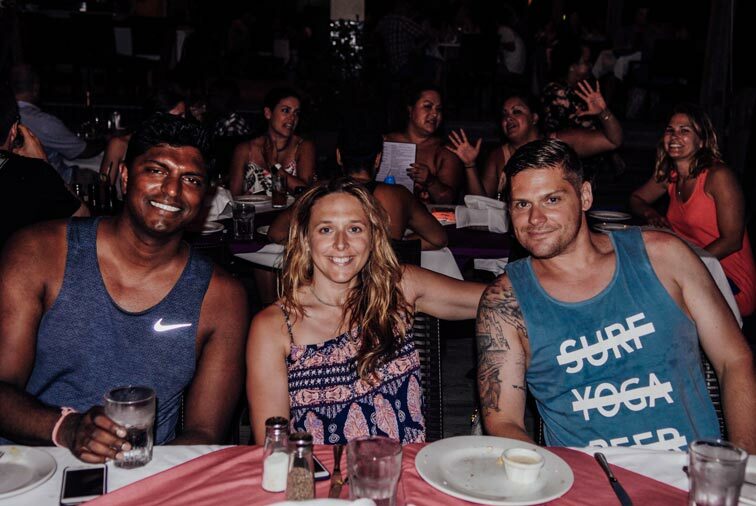 Imagine your days filled with workouts, incredible meals, sun tans, boat cruises, and simply enjoying life. Location Location Location! 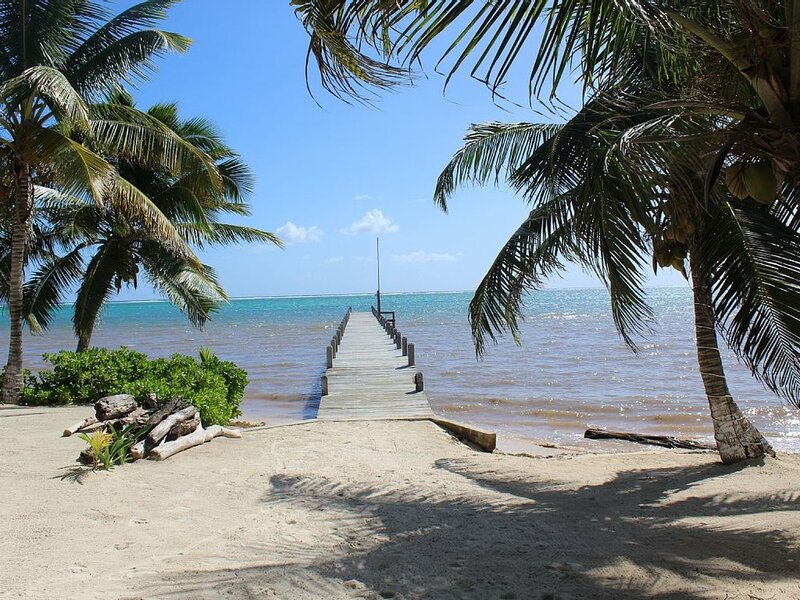 Located in the southern portion of the island of Ambergris Caye, San Pedro is one of the best beaches in all of Belize. 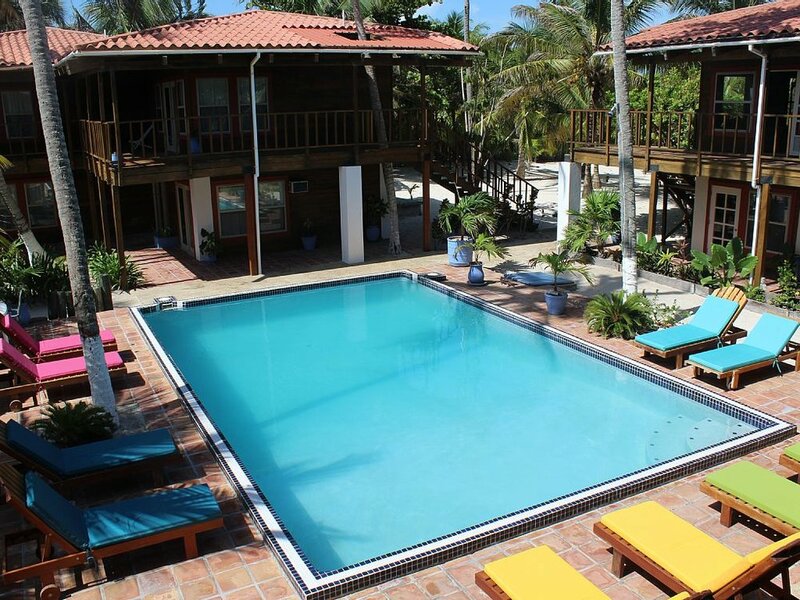 Clear blue water, white sand beaches, and the Caribbean Ocean right at your front door. Monkeys, turtles, and more fish than you can imagine! Plus, minimal mosquitoes due to strong Caribbean breezes! Snorkeling! 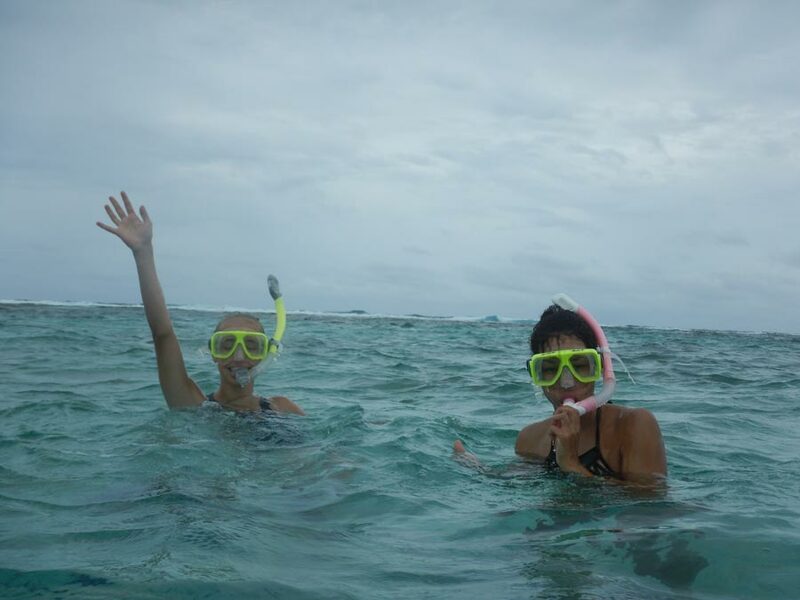 Some of the clearest water in the world, obviously means some of the best snorkeling! 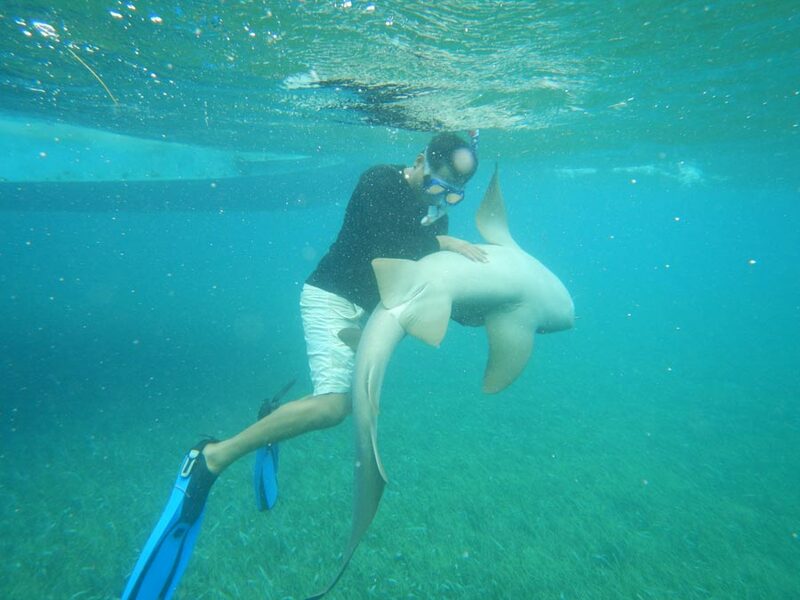 Swim with the fishies and coast alongside sea turtles as you troll the Caribbean Ocean floor! Yoga! 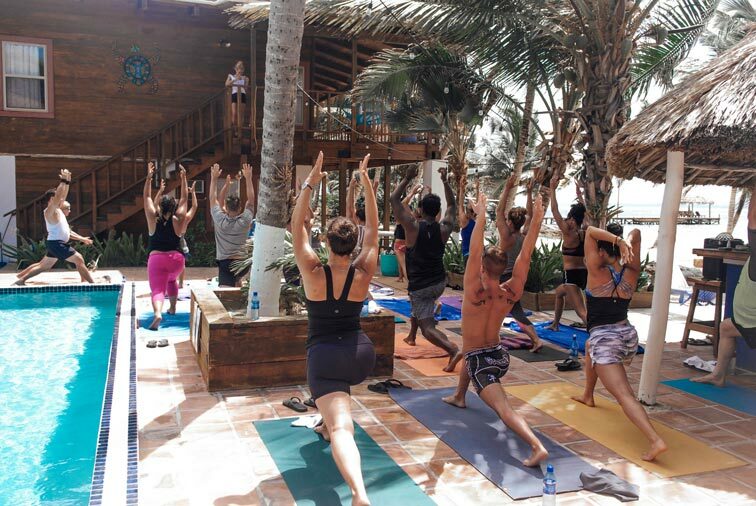 Yoga classes on our own stretch of white sand. Nama'stay right here FOREVER! Food! Fresh locally sourced food. Keeping it healthy and hearty; and embracing the tastes of Belize! Beer! And of course, there will be relaxing beer moments. 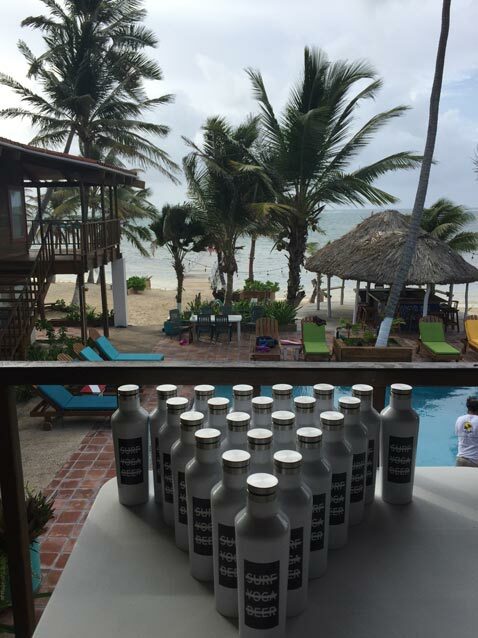 Staying true to our 10 commandments, our days are a cycle of detox-to-retox because hell, we're on VACATION. We're here to have a damn good time, not take ourselves too seriously, and leave feeling renewed in body AND spirit. This is a trip of a lifetime. We would love to have you join us if you have a good attitude about life, enjoy making new friends, and want to try something new! Get ready to find abs you've never thought you had and namaste yourself to bliss at the same time. She's bringing the perfect balance of intensity, tranquility and good vibes! As long as he's there all you need to know is you're in good hands. He'll be driving golf carts to secret beaches, taking care of all logistics and making sure you've got everything you need! This young fitness buck has crazy amount of fun enthusiastic energy to keep your days full of laughs and sweat! Find him at the Fhitting Room in NYC teaching more than 20x a week! How do I get there? Are there flights? Do I have to do the Digital Detox? Is there wifi? What is the preferred currency in Belize? And how much should I bring? USD is totally fine. If you love to buy souvenirs many places have ATM’s and may even take credit cards. We believe something between $200-$300 is a nice amount. Can I just sit back and unwind the whole time? How soon does it fill up, and how does the waitlist work? We fill up very quickly because of our limited amount of beds, the sooner you can book the better. The waitlist works on first come first serve. Once we contact you off the waitlist you haev 48 hours to book your spot otherwise we move on to the next person on the list. Is there a caretaker and house keeping? Are the power outlets the same in Belize as in the United States? 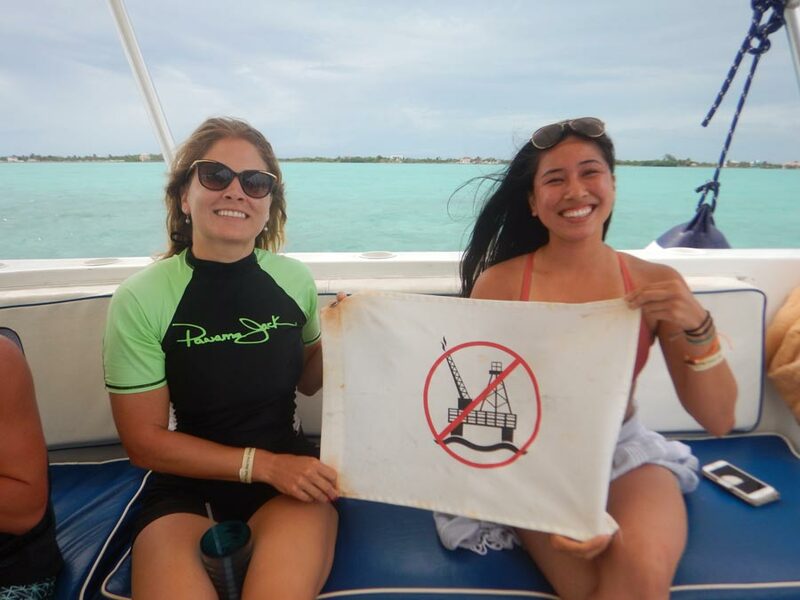 Belize has the same voltage and frequency. So you don't need an adapter or converter. Do I need to bring a towel or yoga mat? Basically all you need is yourself. But in case you want something softer for sunset yoga, yes a thick yoga mat would be great. Also you should purchase an SYB towel, thats prolly the coolest thing you can bring. Try to go light on the packing list, people end up wearing just a few articles of clothing the whole week. Oh ya and running shoes and bathing suit would be a good idea too. Be safe and you won’t be sorry. Crime is very minimal and is usually of the petty theft variety, typified by small time thieves seeking cash or things they can readily turn into cash electronics like laptops, iPhones and cameras. Don’t flaunt jewelry or cash and keep your valuables secured and locked up in the hidden storage bodegas and mini-safes we provide in each room when you are not using them. Do not take anything of value down to the beach unless it is tightly attended. Also don’t worry we are always sticking with our SYB group so we will all keep an eye out for these sorts of things. A $500 deposit is due to confirm your reservation. If you purchase a deposit, your remaining payment will be due 30 days before retreat start date. Your down payment is non-refundable or transferable. Helllllllo Miami, we have our 3-night trip set on Veterans Day Weekend, just ditch work early on Friday. 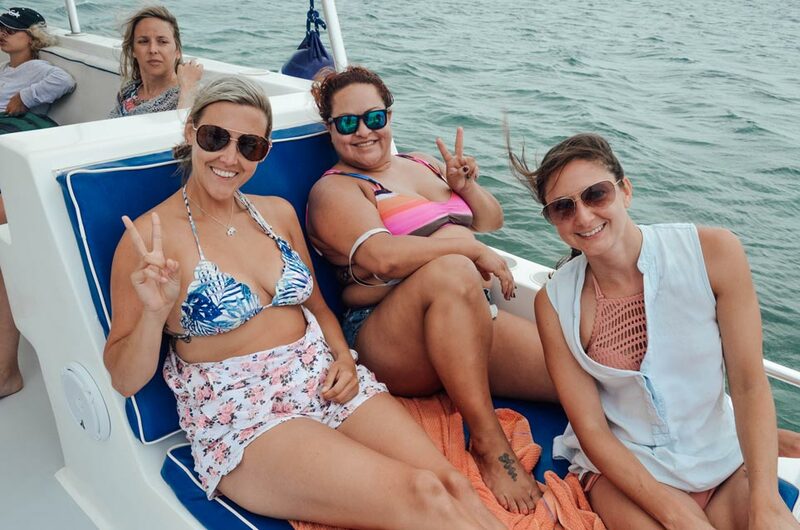 We get everything you can think of Miami style: tan-lines, sweaty workouts, bikini attire all day, cafe Cubano, and long nights dancing.